Today we’re going to look at the Marcy MP3100 Smith Machine and my thoughts on it. One of the biggest ways to make a difference to your training is having access to training equipment in your own home. When you don’t need to travel to train, it’s a lot easier to get all your sessions done. You can even add little bits of supplemental training at any time you want! 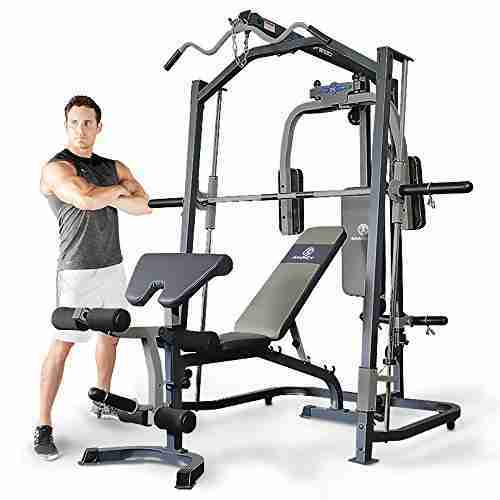 The Marcy MP3100 Smith Machine Home Gym is a great recommendation in this area for beginners or intermediate users who want quick and easy home access to a gym. For advanced users it’s great to do some basic maintenance work at home, though it probably isn’t the best investment. These users should look at more advanced items, such as the Body-Solid Series 7 and the Marcy Diamond Elite. Space is a big problem because most of us don’t live in mansions, and space is a bit tight. I’ve used plenty of home equipment over the years, though having a fold-away bench is pretty much the most some of us can manage. If you do have a little more room there’s some excellent creations like this smith machine home gym. These types of units are a great investment if you want to boost your development, I’ve been using similar set ups for years! Marcy’s MP3100 is basically a gym in itself, it doesn’t take up much room yet has a bench, pulley system, leg attachments, pec deck and more. This is definitely the best way to get a lot of workout potential in a limited amount of space. Now obviously it also has drawbacks which we will discuss below, but overall this is quite a solid home gym. 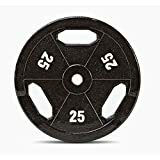 It can be used to work the body as a whole and is reasonably priced, though it isn’t ideal for heavy lifters and will eventually be outgrown by users who are looking for a good amount of development. The fact that this has so many different stations is a real blessing for people who are tight on space, which is probably most of us. This unit combines many pieces of equipment in to one multi-gym set up. The MP3100 has an adjustable bench underneath the barbell area giving almost as much functionality as a free standing bench. This bench can be adjusted too, in fact it’s the barbell being attached to the smith rack which could restrict the number of exercises you can do with the bench. Keep in mind the rack is there to keep you safe, this gym is designed to not need a training partner/spotter/coach when you are using it. There are also attachments that fit with the bench and give even more options, like the leg curl fixings and the arm curling support pad. Add to all of this the pec deck and the pulley system which has handles in high and low positions, and you’ve got a versatile piece of equipment. All of this makes it a much nicer option than buying all those pieces of equipment separately, and being able to fold the bench or take it out of the unit entirely gives even more space saving potential. Like we mentioned in the last paragraph, the barbell on this unit is part of a smith machine set up. That’s probably obvious from the name of the machinery, right? A smith machine is basically a barbell fixed on to some steel rails, so that it can’t be separated from the rack. Smith machines have safety stoppers too, which are adjustable. This lets you change the height so it can be in a different place for, say, squats, compared to where you want them for bench press. Having this type of safety lets you push harder and lift heavier, because the Marcy smith machine is there ready to catch the bar if you can’t lift it back up by yourself. Obviously this safety helps to prevent injury, but there’s another reason you want this feature. Put simply, being able to lift heavier lets you progress quicker, and that is exactly what the Marcy MP3100 Home Gym is designed for. The design of this smith machine multigym isn’t just a space saver – it’s taken into consideration what it actually needs to be used for. The MP3100 is great for upper body, lower body, and even core work. With the right workout plan, you can target any area of the body effectively. Marcy Pro have been making fitness equipment for a long time and their equipment can be found in gyms all over the country. That alone shows they know how to make a good piece of equipment. To back it up, there’s a great manufacturer warranty included. This gives 3 year cover on all parts of the unit, except for upholstery. Of course upholstery is the most likely area to be damaged, thankfully it doesn’t really affect the multi-gym much though – you can still use a torn or slightly worn bench with no problem. A defective pulley would be a much bigger issue, and of course that would be covered under the warranty. Because Marcy’s MP3100 uses Olympic size weights, you can easily transfer the weight plates to a different machine whenever you’re ready. That’s great news because you don’t have to re-start if you do decide to upgrade or switch machines. Of course the weights can also be taken off the multi-gym unit and used on free standing bars, so the same set of weight plates will work for both situations. In fact, adding a couple of dumbbell bars to this unit gives you a lot more possibilities to work with. The handles and bar are all well positioned, meaning you can keep the proper body alignment/technique when doing your workout. The pads on the pec deck and the arm curl pad are both solid yet gentle on your arms, while the bench has a good width and again is comfortable to use. Leg attachments come with nice thick foam covering which should last a while and won’t deform or tear easily. For the price this is available at, it’s really hard to beat. It costs about the same as buying basic versions of each separate piece of equipment which the MP3100 already has built in. Add to that it’s all in one reliable machine, which comes with a great warranty, and you have a great value for money product. Being such a big unit which lets you target any body part also has drawbacks. The first one of these is simply how long it takes to put together. There are instructions included with the smith machine but these aren’t as clear as they should be. That means you have to be careful putting it together, making sure it’s all done properly. I had a friend helping and it still took us almost 3 hours to finish setting up, not a quick process. The Marcy MP3100 smith machine can handle quite a lot of weight, in terms of both the user and the weight plates. Users are limited to around 300 lbs, which is pretty heavy so shouldn’t be a problem. The amount of weight plates that can be added is limited too though. That means your overall development will eventually hit a wall, and you’re going to need something different to keep progressing. Some attachments are worse than others for this. The leg attachment is an area that I’ve quickly maxed out. The weight can be taken up to around 250-300 lbs for bigger lifts like squats or the bench press. That’s plenty for most people but when you get into heavy lifting it isn’t all that much. For heavier compound lifts something like the Body Solid Pro Club Line Counterbalanced Smith Machine. A lot of multi-gym units add even more variety just by having a few bodyweight stations. Things like a chin up bar, or a dip station, can really add to the uses of a multigym. The MP3100 doesn’t have anything like that, so you are limited to the machines already built in. Bodyweight work is something I like because it’s easy to build on without needing large weight racks or lots of plates around. These simple, effective exercises can be done independently or added to a weights workout, though with this home gym, neither is an option. For heavier lifters, the unit can get a bit imbalanced. Putting big amounts of weight on the bar for squats (as an example) can make the entire machine start to tilt as if it’s going to tip over. You’ve got to balance this out by putting enough weight on the opposite side of the machine as well. This is an extra job that isn’t needed with some pieces of equipment, and not having enough weight can be a problem too because you need enough weight for both your lift, and to use as a counter-balance. As you can see there’s a lot to consider with the Marcy MP3100 smith machine. Overall I would suggest this for those on a budget or people lifting moderate but not heavy weights. For anybody wanting to go beyond 300 lbs on a compound lift, you need to look elsewhere. Also, if price isn’t an issue, there are better options out there.